Fireguard® System: UL2085-Listed, equipped with 110% secondary containment, meets ballistics and vehicle-impact resistance standards as well as all national codes for fire-protected all-steel tanks. Built under license by the Steel Tank Institute (STI) and supported by STI’s 30-year warranty. 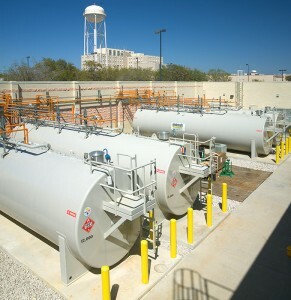 Double-Wall Tanks: UL142 Listed with double-wall construction. Built under ISO 9001:2008 Quality Management System, and complying with NFPA-30, Steel Tank Institute and International Fire Code requirements. Chemical and Specialty Tanks: steel and stainless steel tanks for DEF, chemical, methanol or water storage, compliant with UL-142, UL-2085, API-650, API-620, AWWA D-100, NFPA-30 and NFPA-22. PermaTank: UL58 and UL1746 listed, steel inner tank with 100 mils fiberglass outer jacket for corrosion protection and secondary containment. ACT100: UL58 and UL1746 listed, steel double-wall tank with exterior fiberglass coating for corrosion protection. ACT100-U: UL58 and UL1746 listed, steel double-wall tank with urethane exterior coating for corrosion protection. Above-Ground Fuel Tank Selection Guide. Chemical and Water Tank Selection Guides. Request a Price Proposal on Storage Tanks. Download Product Data and Engineering Specifications. Want a Simple Way to Specify a Transfer Switch? Done! Overlooking this Item Can Destroy the Life of Your Underground Hydronic Piping System. I was very impressed the first time I dealt with David. I was recommended to David’s company by our Cummins sales representative, and David helped me thru my first fuel delivery system project for a Florida Assisted Living Facility. He does not just send general cut sheets of systems, … but details such as pump HP values, cables sizes, fuel piping sizes, sensor requirements, etc. I would recommend him highly to anyone struggling with fuel system design. Kudos of the highest order to David Hurtado. Always responds quickly and professionally. Best manufacturer's rep in the business. Our company has a very positive opinion about the service received from Hurtado.cc. We feel confident in getting professional attention in an expedited manner, whenever we request a quotation from them. First time doing business with La Marche / Hurtado.cc. It was a pleasure to deal with a company that REALLY cares for customers, since nowadays for many companies Customer Service are words use for advertising purposes only. The technical support received was appropriate, and all interactions were handled in a timely manner. Thank you! !